Now that you’ve installed the AZEK TimberTech Impression Rail system on your deck, it’s time to add accessories that will increase the appeal and functionality of your outdoor living space. 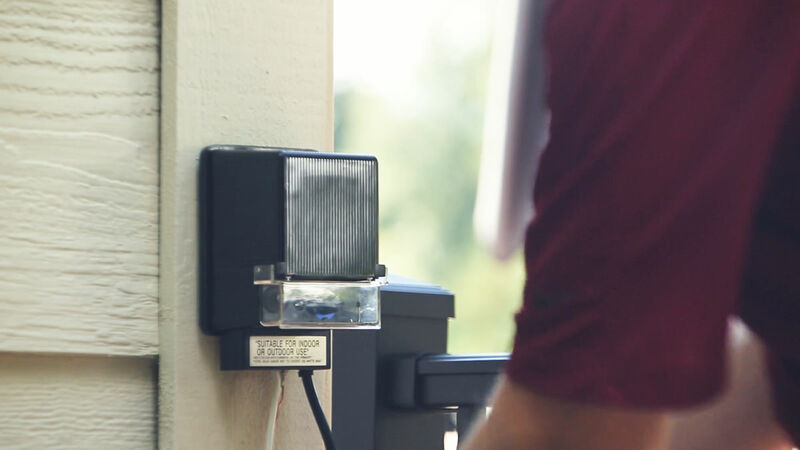 This post, and video will take you through the installation process for riser lights, in-deck lights, and accent lights, as well as fascia—which provides a truly finished look to your deck. As always, remember to make accurate measurements, and give yourself ample space to organize the AZEK pieces in a way that doesn’t obstruct your work area. It’s also important to make sure you have all the necessary parts and equipment before you begin your installation. 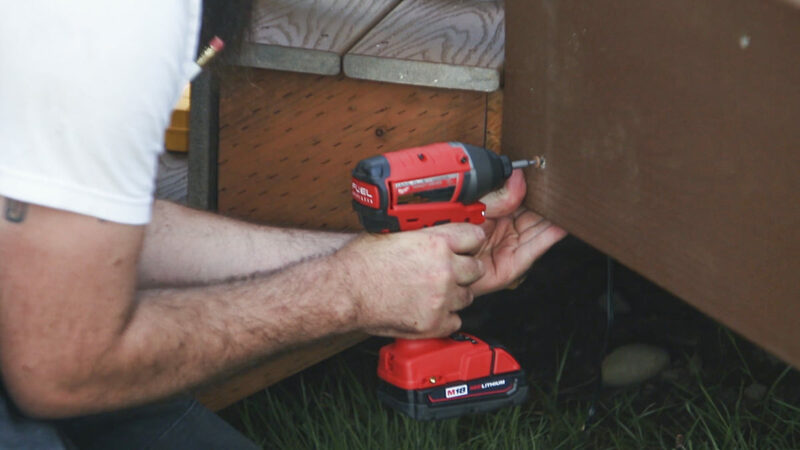 You’ll need a power drill with drill bits, along with a wire cutter, wire stripper, impact driver, 2.5 mm Allen wrench, and a miter saw (we preferred using a compounding miter saw for this project). Start by measuring your fascia boards in order to make the correct cuts. Consult page 4 of the TimberTech installation guide for proper gapping requirements. We had to cut our fascia at an angle to fit our existing deck. We then marked evenly-spaced holes down the entire length of the fascia, and drilled them out using the TOPLoc™ fascia bit. From there, drive TOPLoc™ fascia fastener screws through the fascia just to the point where the head of the screw is flush with the fascia board. 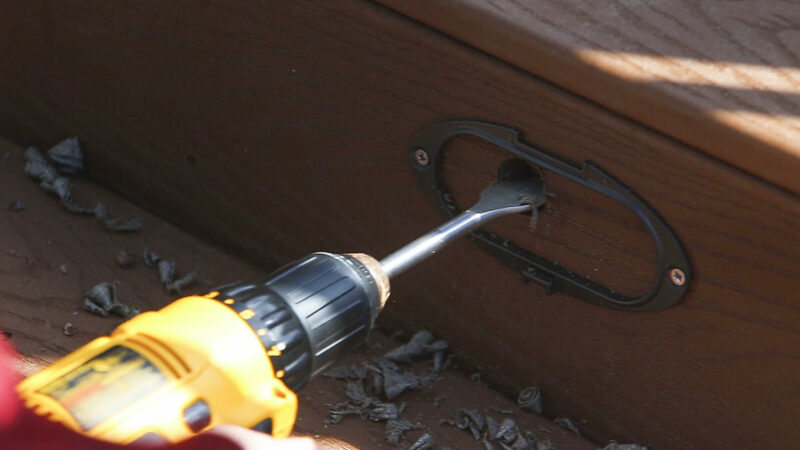 Using the TOPLoc™ bit, and job-specific screws is an important choice when installing composite fascia because they allow the fascia to “float," or hang, on the screws. This in turn allows for the expansion and contraction that is customary with composite fascia. In contrast, using regular screws will result in the fascia warping. To mount the fascia to the side of the deck, start at one end and work your way to the other end—so as to keep the fascia board flat as you are hanging it. Continue to add each piece of fascia in this fashion around the whole deck. Note: the fascia mounting instructions here are for TimberTech brand fascia. Other brands of composite fascia will have different hanging instructions. Start by consulting the AZEK lighting installation guide. For the accent Lights on your posts, use a tape measure to mark where the light will be placed. Now remove the accent Light cover from the light’s back plate. Next, pre-drill your mounting holes for the accent Light, using the back plate as a template. Double check the placement of the accent Lights on your post before drilling, and use the provided screws to secure the back plate onto the post. Feed the light’s cord through the largest hole of the back plate, re-install the accent light cover, and tighten the set screw. 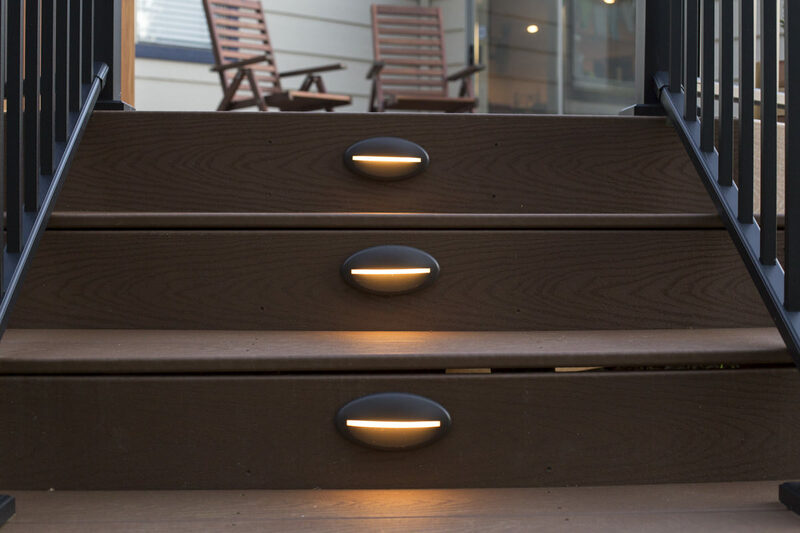 For lighting on your stairs, measure the vertical and horizontal center point on your stair riser. Using the included template (or by holding the back plate of the light in place), pre-drill your holes to mount the plate to the risers, and secure the plate with screws. Cut a 1” hole at the center point, and guide the cord into the hole. Now secure the housing to the back plate using the set screw. Mark the centerline of the deck plank where you would like each of your in-deck lights to be placed. Mark the spots where the in-deck lights will be, and drill holes with a 1” spade bit. Now guide the wiring into the hole. Push the lighting fixture into place until the flange touches the surface of the deck. Wiring connections will be made in step 4. Use the silicone-filled wire nuts included with your lights. Working with wires requires careful attention, so always consider hiring a qualified electrician for related tasks. 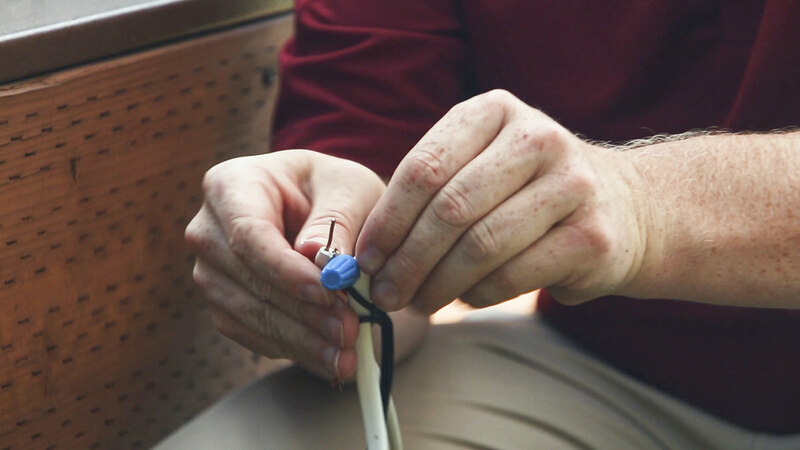 Start by stripping the wires by ⅝” on their end, and align the frayed conductor strands. When splicing, be careful not to pre-twist the wires. Now place the stripped wires together with their ends at even length (though smaller stranded wires should be placed slightly ahead of larger solid or stranded wires). Do not twist the wires together. Just attach the connector to the wires by twisting it into place, pushing firmly until you’ve tightened the connector fully by hand. Be careful not to over-torque. Wipe excess sealant in and around the conductors. Next, mount the transformer to a nearby wall that will be easily accessible and close to a power supply. Here, we decided to tuck it around the corner from the deck so it’s out of plain sight, but still easy to reach. AZEK TimberTech is a durable way to enhance your outdoor decking space. 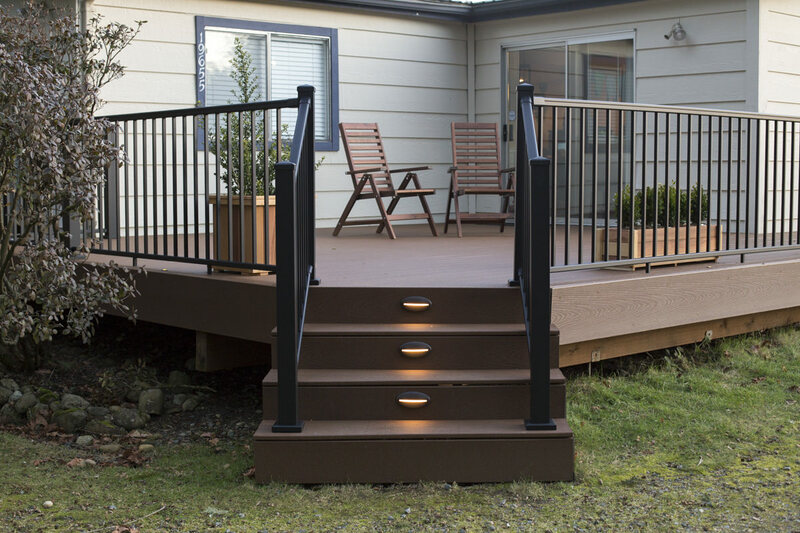 By adding lights and fascia, you’ll improve the look of your deck while giving it much-needed utility. From proper drying to cleaning and brightening, learn why patience and preparation are essential to any deck staining project. In this post, Ron covers how to finish a decking project.